One of the ways to track adoption of email authentication is to periodically execute DNS queries for collections of domains. One popular collection of domains is curated by Alexa, an Amazon.com company. Their list of top websites is cited by many publications on the web and in print media; you can find out more about this collection here. The Alexa top sites do not necessarily send email, but they’re more familiar to end users than other domains. Therefore email messages from these domains are more likely to be opened by consumers, which makes them prime targets for fraudsters to impersonate. If you aren’t familiar with these protocols, you can use our Glossary to begin learning about them. The Sender-ID protocol was a merging of SPF and a proposal from Microsoft named Caller-ID. It was promoted by Microsoft in the mid-2000s, but did not achieve wide-spread adoption. However people still ask about it, so it appears in the graphs below for purely informational purposes. It should not be considered for new deployments. Check the sections below to see which email authentication protocols are being used by the Alexa Top Sites. Or to find out more about how a given protocol is being used, Skip to the Protocols section below. 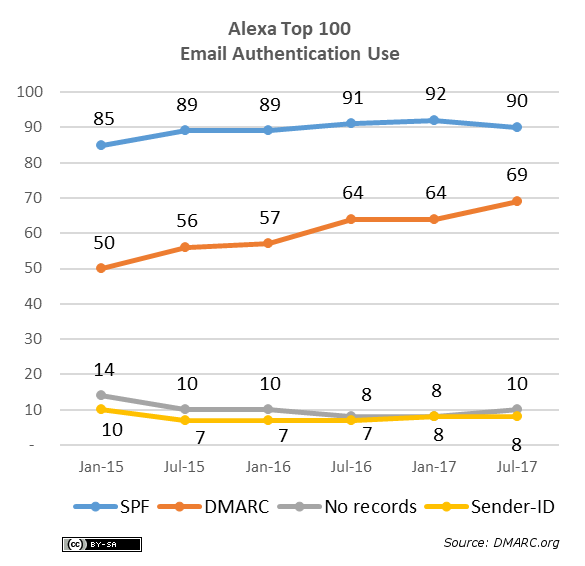 The following graph shows the number of domains within the Alexa Top 100 that are using different email authentication technologies. Note: Sender-ID is not in widespread use and should not be considered for new deployments. It is only included here to document it’s decline. 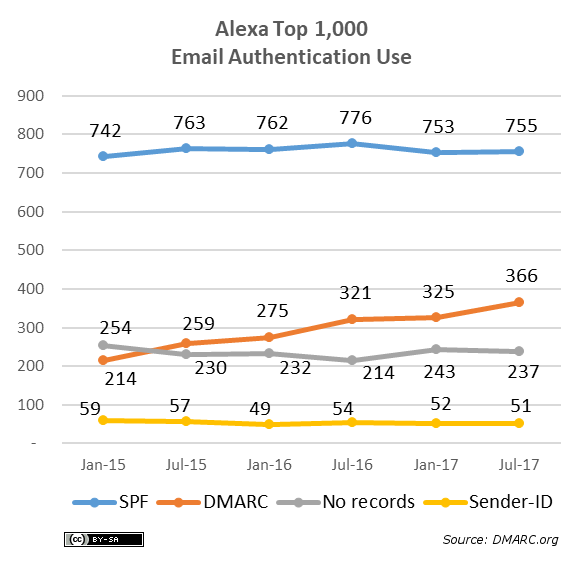 The following graph shows the number of domains within the Alexa Top 1,000 that are using different email authentication technologies. 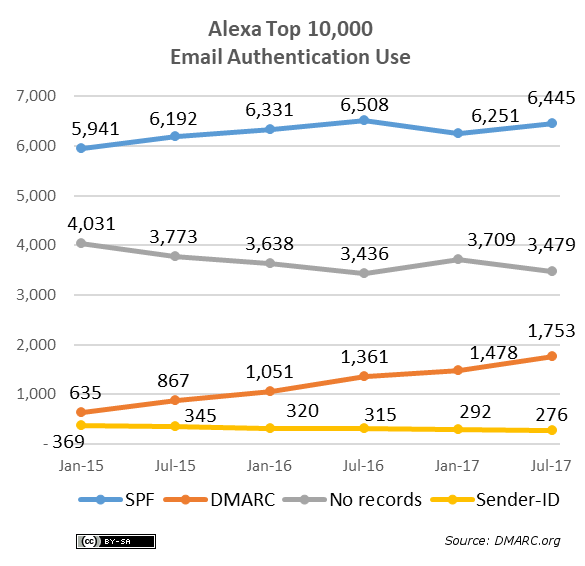 The following graph shows the number of domains within the Alexa Top 10,00 that are using different email authentication technologies.